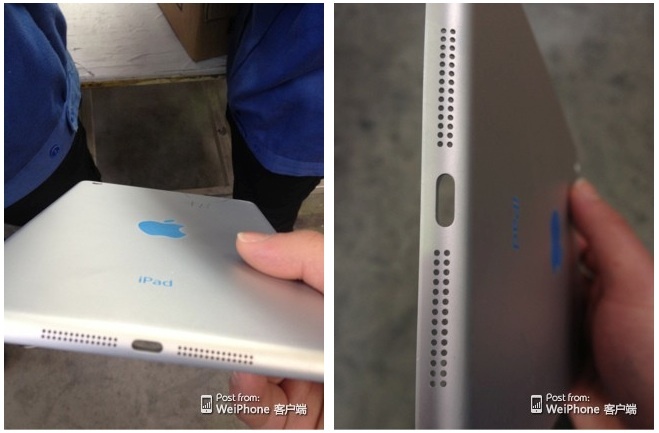 Mobiles Pie points to a forum thread [Google translation] at Chinese site WeiPhone sharing a number of photos of what may be the rear shell of the second-generation iPad mini. 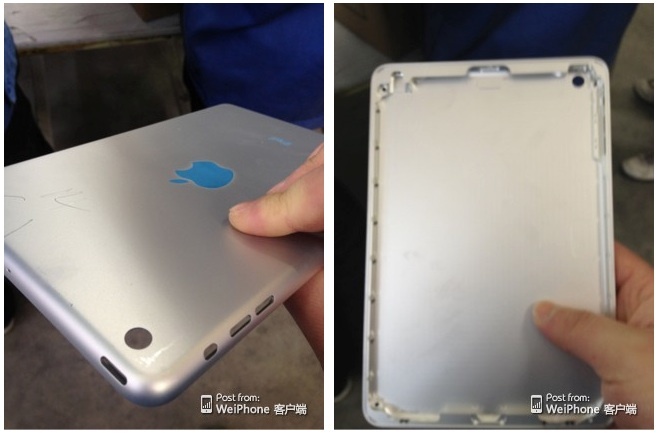 The photos show a shell very similar to that of the current iPad mini, although from some angles it does appear to be slightly thicker. It is difficult to tell, however, whether the apparent increased thickness is a genuine design change needed to add a Retina display and accompanying battery improvements to the device or if it is simply a bit of an optical illusion due to the fact that the edges of the shell have not yet been chamfered as they are in the final product. The photos also show a bright blue Apple logo and "iPad" text on the rear shell, but it is possible that this is simply part of the process used to create the mirrored logo and text as seen on the current product. Alternatively, it may be an effort to add additional color to the iPad mini as Apple did with the iPod touch last September and has been rumored to be using for an upcoming lower-cost iPhone. Perhaps notably, the forum user who posted the images had posted back in December [Google translation] sharing images of what he said was the initial machining process for the iPad mini rear shell. Their legitimacy is, however, unconfirmed. Update 12:24 PM: Nowhereelse.fr has taken a close look [Google translation] at the two photo sets from December and this week, noting in both sets the presence of boxes labeled "Catcher", which is indeed one of Apple's primary casing suppliers. The site believes, however, that the latest batch of photos is of the current iPad mini rather than a second-generation model. Those pictures are too clear. If they are not blurry then they are not legit! A new iPad mini?! But I just bought mine last November and it won't work anymore when the iPad mini 2 will be available! Let's sue Apple for updating products! How am I going to wrap that around my wrist? The "blue" logo could just be the logo covered in protective plastic, like when you buy sheets of plexiglass from Home Depot. There will not be a thicker/heavier ipad mini. if they can't fit retina in current specs, they will wait. If you know apple at all this is obvious. Not really. The iPad third gen was thicker and heavier than the iPad 2 to accommodate retina. The blue logo and iPad word mark are likely just due to a physical masking material placed over those areas to keep them smooth. The rest of the shell gets blasted with a physical media to give the matte finish. Edit: Also, the chamfered top edge would be machined post media blast to reduce the amount of masking required.